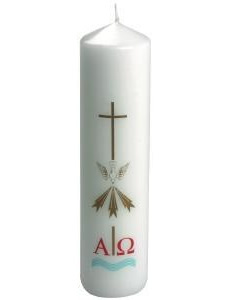 An elegant Baptismal Candle bearing the sign of the Cross, as well as the Alpha and Omega letters on a water image. Ensure your candle is firmly upright and the holder is on a stable surface. Ensure the wick is upright and in line with the candle. If needed, trim to about 1/2" (1 centimetre). Use a taper to light the candle exposing the full wick to the taper flame. To relight, ensure the wax pool is clear of debris. Don't move the wick from its old shape. Extinguish the candle with a snuffer. Don't damage the wick or the lip of the wax pool. 8" x 2" White Baptismal Pillar Candle Single is published by Charles Farris and is our 2239th best seller. The ISBN for 8" x 2" White Baptismal Pillar Candle Single is BC-01A. Be the first to review 8" x 2" White Baptismal Pillar Candle Single! Got a question? No problem! Just click here to ask us about 8" x 2" White Baptismal Pillar Candle Single.